Automate VI search, analysis and edit operations easily. Shows properties that LabVIEW does not display. 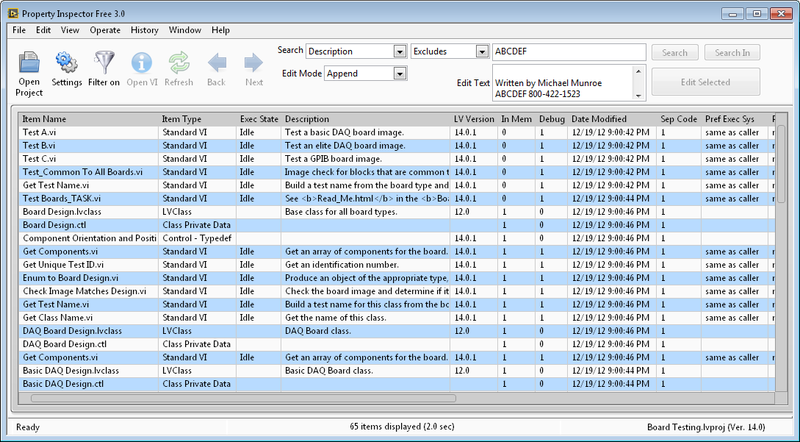 ABCDEF updates their developer productivity utility that easily searches and edits properties of multiple VIs simultaneously to help save development time and optimize product quality. Additionally, it is powerful analytical tool. It quickly performs over 70 operations that would otherwise be impractical, if not impossible with standard LabVIEW. Searches all the items in your project, based on 42 VI properties and metrics based on 9 criteria including: VI Description, In Memory, Date Modified, Reentrancy, Clones and Allow Debugging. Sort any column by clicking on the header (i.e. Data, Code or File Size, Date Modified or Revision). Can revert back to unsorted. Edit 22 of the properties automatically by selecting all or some VIs including Description and Password. Powerful string manipulation functions can prepend, append, replace or remove the entire string. Free version is limited to editing one VI at a time. Global Exclusion™: All string parameters can be searched simultaneously for a string to EXCLUDE! This utility is very versatile and configurable. Select only the columns you want to display to search for the properties that most fit your requirements. Sort the columns three different ways. Sort the results by any column. Enable only the project items relevent to your needs. Search within the existing result by a different item to narrow the scope. Open a project, LVLib or LVClass file. Easily finds files not in memory or broken. Easily set or remove password protection for the selected items. Open dozens of front panels or block diagrams together and close them in a single operation. 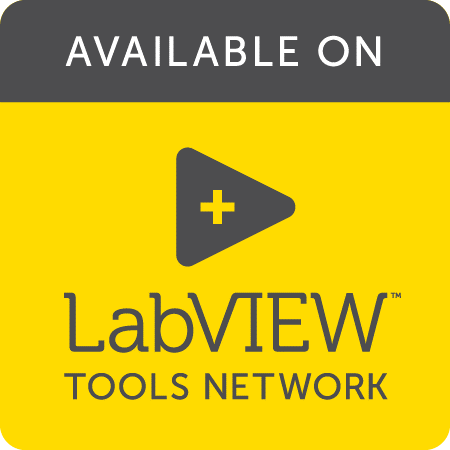 This product is available on the LabVIEW Tools Network. Download directly here or find it in VI Package Manager. Need more features? Upgrade to the full Property Inspector 3.0. Here are several useful examples of search and edit operations. The search and edit settings are expressed exactly as it appears on the screen. Some examples show the edit operation after the semi-colon with sample edit text and notes in parenthesis. Data Size Greater Than "100K"
VI Version Less Than "11"
How many VIs in the project are Bad? How many VIs in the project are not the current version? How many typedefs are strict? Not strict? How many VIs are in class? Not in a class? How many VIs are in library? Not in a library? Which reentrant VI has the most instances in memory? Which VI uses the most data memory? Which VI is the oldest? Newest changes? Which VIs are set to Inline? Which VIs are not Inline, but could be? What is the oldest LV Version in the project? Which VIs have History Text? Which VIs use a Runtime menu? Which VIs have Allow Debugging enabled? Which VIS have Automatic Error Handling enabled? Which VIs have Suspend when Called enabled? How many VIs are set to show on a specific monitor? Do any VIs use transparency?